That fennel frond pesto I made a few days ago only used up about half of my stash. The other half was saved up for the fennel patties I fried up tonight. These little cakes, filled out with Pecorino cheese and bread crumbs and bound with an egg, had a subtle anise aroma tempered by scallions, garlic, and a dollop of mustard. 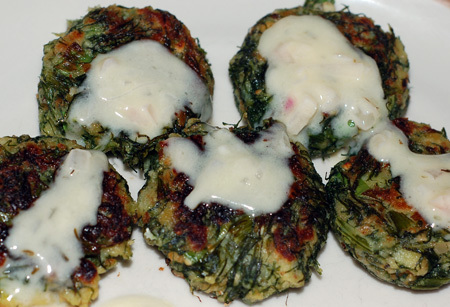 Jeremy looked at them very skeptically, but admitted that they were actually very tasty, and they reminded me of nothing so much as the adored spinach balls from my childhood (a recipe I’ll have to share here sometime). 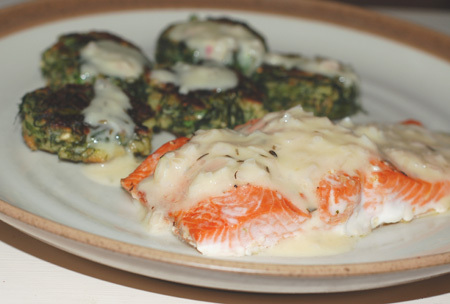 I paired my fennel patties with baked Copper River salmon fillets and a lemon thyme beurre blanc I’ve made before, not bothering to strain out the shallots. It all worked very nicely together, and now I can say pretty confidently that I can cook fennel fronds in a way we like—the bulbs are another story, however, and it is somewhat unfortunate for us that you have to buy the bulb to get the fronds. Remove the thick, tough base of the stems. Lay all the fronds in one direction and rinse gently in a large bowl of water. Bring a large pot of unsalted water to a boil, add the fronds, and cook for 10-15 minutes (or until the thickest stems crush easily). In the meantime, tear or cut the bread into 1/4″ pieces, and moisten with the melted butter. If using dry bread crumbs, you may want to add a bit of chicken stock or cooking water from the fennel, just enough so that they are no longer hard. Drain and rinse gently with cold water. Drain again, gently squeezing the extra water out like you would wring out delicate lace. Starting from the ends of the stems, mince finely as if chopping chives. Add the chopped fronds and remaining ingredients, and stir together thoroughly with a fork or your fingers. The mass should not be too dry nor very wet; adjust if necessary with either a bit more beaten egg or bread crumbs. Scoop out about 2 T at a time and form into about a dozen little patties. Fry in a little olive oil over medium heat until lightly browned on both sides. Serve hot or room temperature.